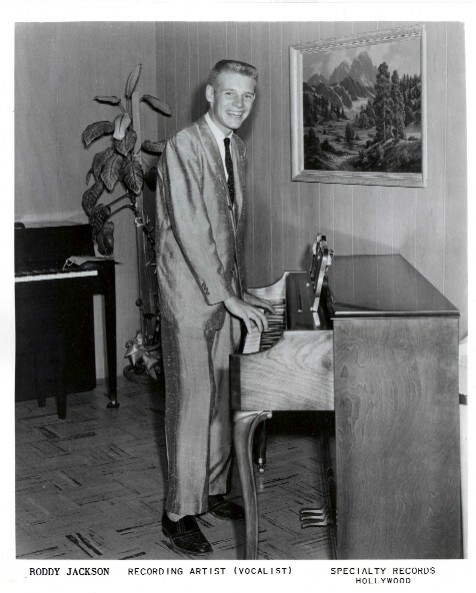 In 1954, aged 12, Roddy formed his first band, The Dreamers, and began performing on the airwaves of KYOS in Merced. At that time Roddy played the drums but really wanted to put the tenor sax like Earl Bostic and Scott Clifford (Bill Doggett Band), two of his favorite artists. He then began taking clarinet lessons and then the alto sax before switching to tenor sax. He also learned the trumpet and trombone. began taking clarinet lessons and then put the alto sax before switching to tenor sax. 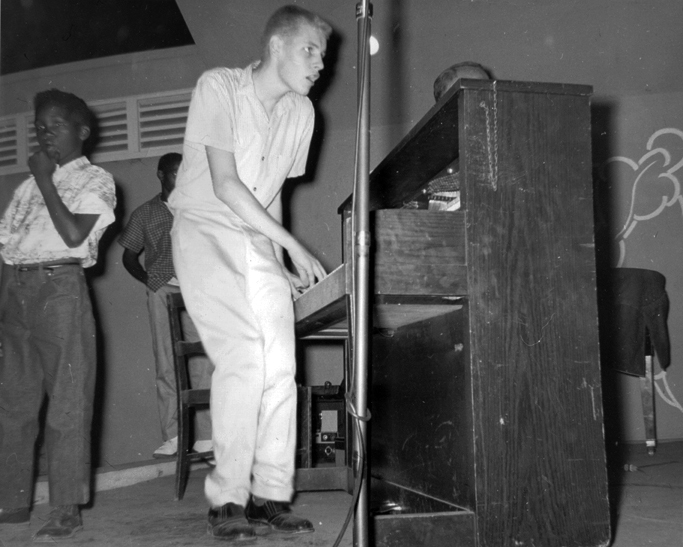 In 1956, Fats Domino became the new hero of Roddy, who began playing the R&B piano. 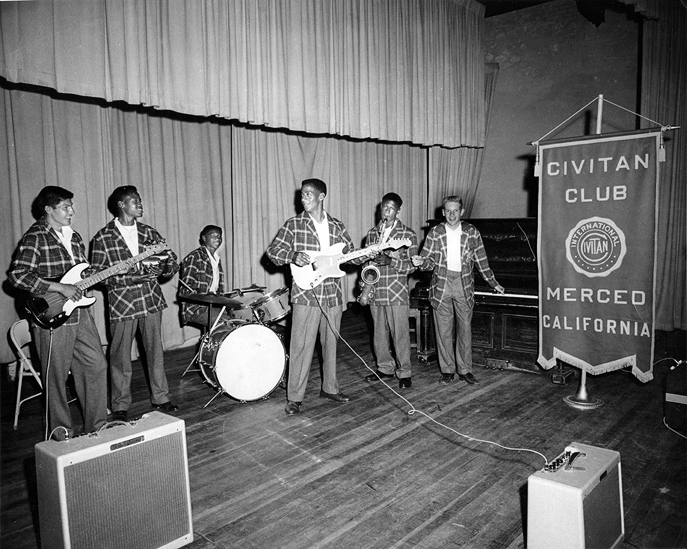 Accompanied by a new group of black musicians called The Blue Notes, it quickly became popular around Merced and toured in the central valley around Modesto and Stockton. Then strongly influenced by Little Richard , he dreamed of joining his idol’s label Specialty Records. During an audition for the label the young Sonny Bono persuaded Art Rupe, the boss, but not to sign Roddy’s group The Blue Notes, just Roddy. Of the recordings made at that audition, the only remaining one is the version of the unbridled “Whole Lotta Shakin ‘Goin’ On” on the CD ACE. “Miss Ann,” “Lucille” and “Long Tall Sally”, three songs by Little Richard , remain unpublished. 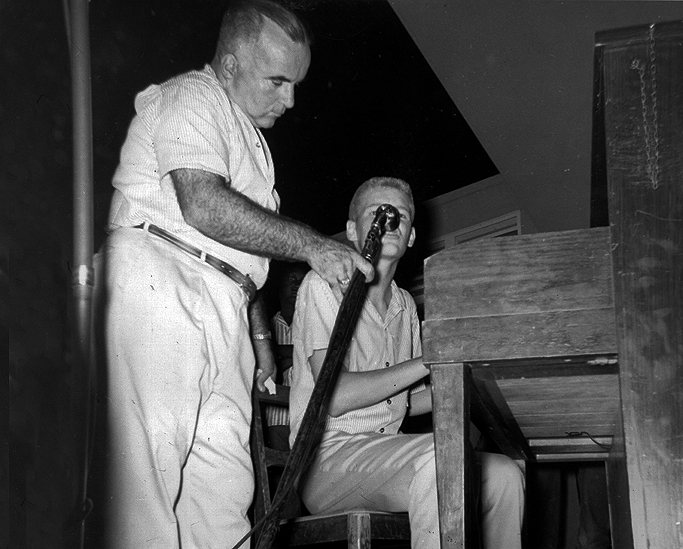 December 12, 1957, Roddy was absent for a day of school and made his third trip to Hollywood for its first session. 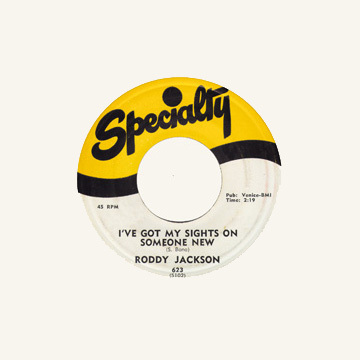 Accompanied by Rene Hall (guitar), Red Callender (bass) and Earl Palmer (drums) he recorded “I’ve got my sights on Someone New,” a composition by Sonny Bono, with the B sode of “Love at First Sight the first single (Specialty 623) released in January 58. 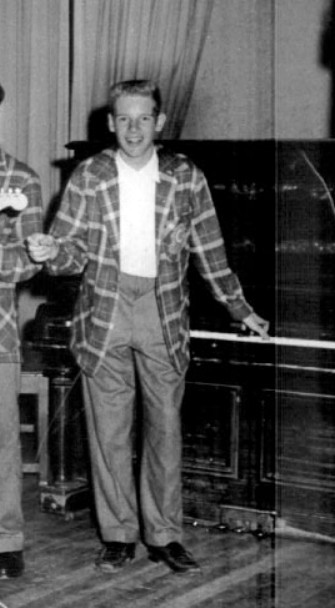 On December 12, 1957, Roddy was absent for a day of school and made his third trip to Hollywood for its first session. 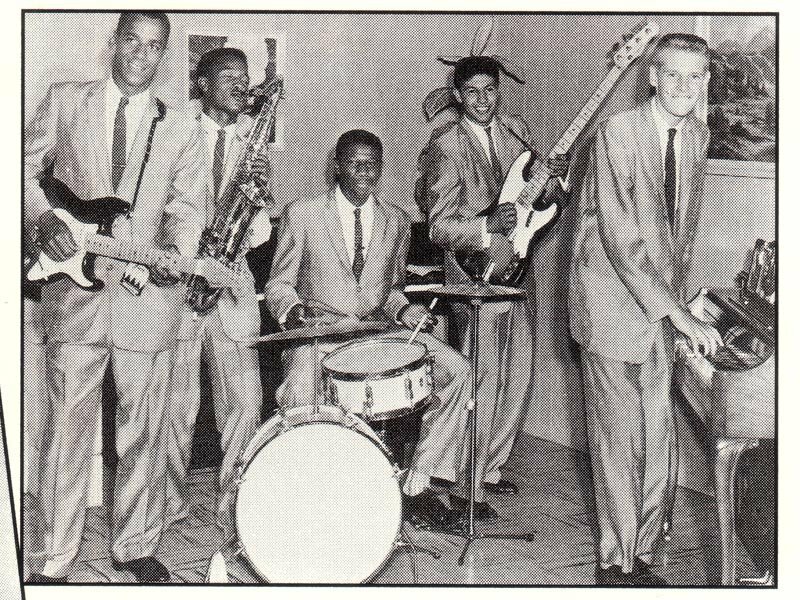 Accompanied by Rene Hall (guitar), Red Callender (bass) and Earl Palmer (drums), he recorded “I’ve got my sights we Someone New,” a composition by Sonny Bono, which will be paired with the b side of “Love at First Sight his first single (Specialty 623) released in January 58. September 8, 1958, back in the studio, Roddy recorded with the complicity of Sonny Bono, the two classic “Hiccups” and “There’s A Moose on the Loose” that will make the second single. This disc will become a classic in every rockabilly collection. The third session March 25, 1959 gave birth to “Gloria and Any Old Town “that would be his new single for the label (Specialty 666). Two very good sides recorded with the help of Rene Hall, Lee Allen and Earl Palmer. In 1960, Roddy went to Modesto, where he worked some time in the group of Chester Smith before joining the U.S. Army and ending up in Germany. 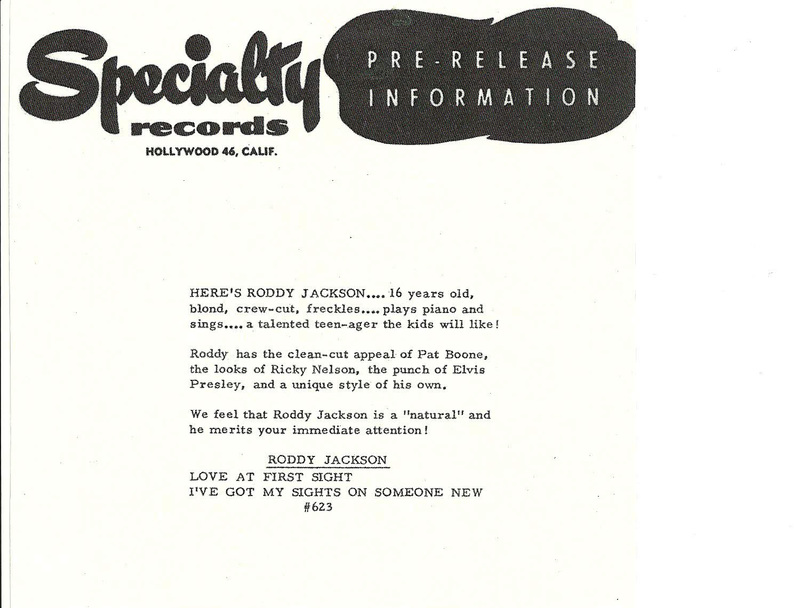 All three Specialty singles were produced by Sonny Bono, with whom Roddy wrote “She Said Yeah” for Larry Williams (Bono using his alias Don Christy). She said yea has become another cult classic recorded by The Rolling Stones, The Animals, Paul McCartney and the Hollies among others. She Said Yea was recently used for a Chanel commercial directed by Martin Scorsese. The Specialty Story CD Compilation, Roddy Lower Right. Has anyone ever heard of a drummer named Freddy Sims or “Fast Freddy”? He told me he played with Roddy in the early 60’s and was married to Kathy McConnel (sp?) sister of Steve McConnel and lived out on Vassar Road. I see him on occasion at the Saloon blues dive in SF. He is still making music…. Fantastic page on a fantastic artist! This is so great, since I wasn’t here in the “old” days…I can get the history of my husband, his brother, and all the talented musicians that came out of Merced! Can you tell me if any of Sonny Bono’s recordings, other than Inner views, have been released on cd, especially his older ones? I really don’t know but Roddy is a lurker. Maybe he knows. The Presidents were great friends of the early Rolling Stones and the late Ian Stewart (the 5th Stone) asked if his new band could perform at our local club at The Red Loin in Sutton Surrey UK. Ian loved our version of Roddy’s song She Said Yeah and The Presidents with producer Glyn Johns recorded it and it was passed to Shel Talmy at Decca Records. We never heard another thing except the Stones, who were signed to Decca, recorded a version and released it on their album Out Of Our Heads. BUT now 53 years later our acetate has been found in Shel’s collection. He is now based at Ace Records in LA and he played our version to Roddy who loved it and it is to be released in June 2018. I managed to get all the old band together and we have made a video which I’ll be posting on You Tube shortly. If anybody knows how to get in contact with Roddy please drop me a line. .